An international team of researchers has found a new method of producing molecular magnets. Their thin layer systems made of cobalt and an organic material could pave the way for more powerful storage media as well as faster and more energy-efficient processors for information processing. The results of this research have been published in the current issue of the renowned journal Nature (DOI: 10.1038/nature11719). In order to boost the performance of computers and reduce their energy requirements, processors and storage media have become smaller and smaller over the years. However, this strategy is about to reach the limits imposed by physics. Components that are too small are unstable, making them unsuitable for secure data storage and processing. One reason is that even one atom more or less can change the physical properties of electronic device components significantly that consist of only a few atoms. However, the exact number and arrangement of atoms can hardly be controlled in metals and semiconductors – the materials that these components are made of today. 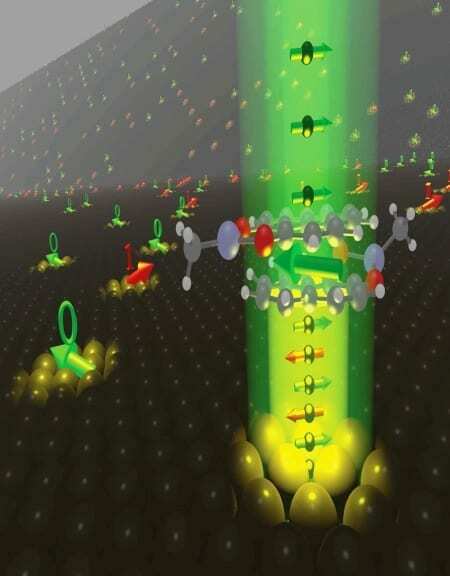 One way out of this dilemma could be so-called “molecular electronics”, with nanometre-scale components made up of molecules. Molecules consist of a fixed number of atoms, can be designed specifically for various purposes, and can be produced cost-effectively in an identical form over and over again. If the magnetic moment of the electron – the “spin” – is also exploited in addition to its electric charge, it looks as though it may even be possible to implement entirely new functionalities, such as non-volatile RAM or quantum computers.